Our first Youth Arts Action meeting of the year occurred this past week. This term we are focusing on building connections with strangers and hearing their stories. Greater Forest Lawn is full of a diverse population and we think they have incredible stories to tell. 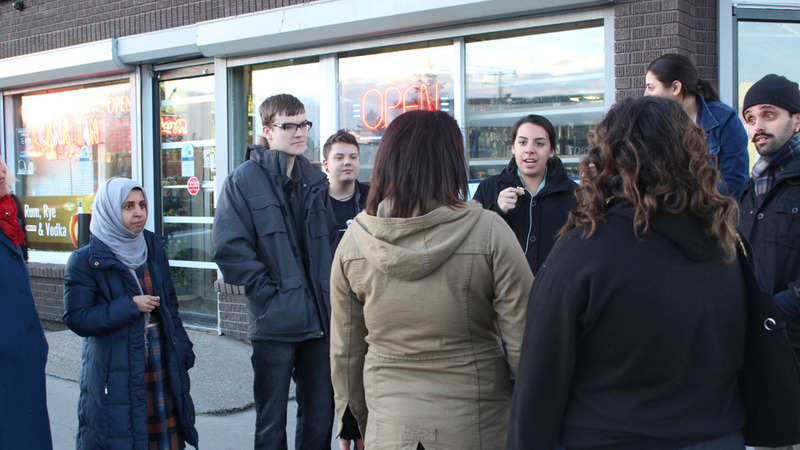 As we ventured out into the streets of Forest Lawn to speak with strangers, and exercise inspired by Toronto-based Mammalian Diving Reflex Artistic Director Darren O’Donnell, we approached random strangers and the youth got to know them. We spoke with a local business owner, a man who has found community through his faith, a man who the youth deemed a “thug” but ended up being a real advocate for social connection and inclusion, and two sisters who have grown up being each other’s best friend while growing up with three brothers. We debriefed by discussing what the social stigmas or assumptions we made about these people prior to talking to them were, and how these differed once we broke down the barriers of being strangers. This was our first investigation into learning about the strangers we call neighbours in Greater Forest Lawn. Stay in touch as the youth leaders/artists in the Greater Forest Lawn Youth Arts Action group dive further into this community to make positive social change.